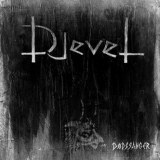 About as Norwegian and mid-90s as you can get, three-piece Djevel (devil) features a member of Koldbrann, an ex-member of Ljå and the vocalist from punk horde Kvertelak. All icy guitar, blastbeats, and acoustic interludes, Dødssanger is perfectly aimed and constructed, and does its job perfectly. It stands out from the crowd due to the songwriting, inspired riffing a la old-school Darkthrone, Burzum and Enslaved and managing to build tormented atmospheric towers with them. Despite the presence of Kvertelak’s frontman there’s very little punk involved in Djevel, the main composer being said ex-Ljå-man Trond Ciakals, the main composer here. The latter, however, is what sealed the deal on this album for me, building up with varied harrowing vocals from yells to groans (all in the band’s native Norwegian) with some very captivating riffs. Despite being so old-school in style, this clearly has a modern twist to it, as seen from the fairly frequent interjected spoken parts and some of the melodies on Paakallelsen, not to mention the clear and modern production that allows for an audible bass without removing the music’s atmospheric qualities. I’d recommend it to any fan of TNBM – yes, you’ve heard it before, but Djevel promise much with this debut that I hope will be fulfilled even more on future releases.